It is important that Sheepdog spend as much time with our daughters as possible, else they are more likely to become meth addicts or end up headlining at Delilah’s Den. Without even being aware of it they are setting their own relationship standards for the future, and they are learning mainly by watching him. So, technically, if one of them ends up grinding one-night-stands on the dance floor or is referred to as the girl who knows how to “hook a steak up,” it would be all Sheepdog’s fault. No pressure there, right? As I am acutely aware of this, I encourage any and all father/ daughter interaction. Over the years they have tried many activities together. They have done the standard dinner and a movie date many times, but it does not really allow for enough quality conversation. They have also gone the more active route of biking and running, but those sports require that the parties be on at least similar skill levels in order for everybody to have a good time (you can’t really talk if you are constantly panting and on the verge of passing out just to keep up). Hiking was a great alternative until the girls had to go in the woods and got all freaked out over squatting in public and wiping with leaves (they get that from their mother). So on to other activities they went. We are not giving up. Recently Sheepdog has been taking Kid A out to practice driving. I don’t care if your daughter is Danica Patrick, teaching a girl to drive is fraught with peril. And frankly, Kid A is not exactly a natural behind the wheel. She and Sheepdog did not do well together in an enclosed vehicle, especially after he yelled at her (in his defense, she almost ran over two pedestrians). After I went out to practice with her a few times (promising myself that I would not raise my voice or clench or cry while sitting in the passenger seat, so as to not derail her already wavering confidence), I was so scared that I actually called the local driving school anonymously. Sheepdog decided he was going to try again to teach our daughter to drive. 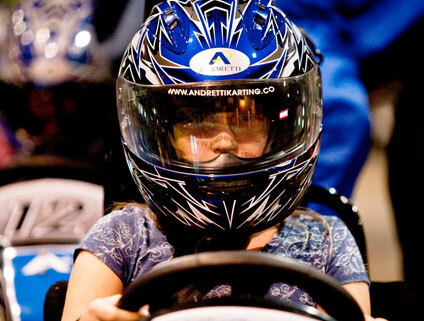 He figured that he should get her driving in a more relaxed atmosphere, so he took Kid A and Kid C (Kid B was at dinner with her soccer team) to the Andretti Speed Lab in Roswell. This place is as cool as the name implies. They have rock climbing, video games, a ropes course, pool tables, bowling, basketball, a comedy club, and the main attraction – extreme SuperKarts, complete with 9 hp Honda GX-270 engines in them. And it was a twofer in that he got to spend some quality daddy/ daughter time together with the girls. Is it too much to ask Kid A to wear this while driving a regular car too? Cause I'm certainly gonna be wearing one in the passenger seat. Round and round the track they went. Sheepdog had a blast. Kid C didn’t drive by herself because she was afraid at first, but she and Sheepdog have another date planned there so she can learn to drive soon. Kid A apparently acquired some decent driving skills on the track, although she still has a way to go before we release her on GA-400. All in all, it was a great plan. Way to go Sheepdog! On the drive home the girls were pestering Sheepdog to bond with them some more. “I don’t know any stories,” answered Sheepdog. “Tell us about your first girlfriend, ” prompted Kid A.
I don’t know if Sheepdog is going in the right direction with this whole father/ daughter bonding thing. He may need a little more coaching first. This entry was posted in Bad Daddy, Bad Mommy, family, Fun Daddy, Fun Mommy, kids, parenting, teenagers and tagged Andretti Indoor Karting and Games, Daddy issues, driving, Electra complex, father/ daughter relationships, fathers and daughters, learning to drive, Notorious B.I.G.. Bookmark the permalink.